Mega Hitmonlee in game: 45 Who? Important notice! Pokemon Mega Hitmonlee is a fictional character of humans. Hitmonlee is a humanoid Pokémon with an ovoid body. Lacking a distinct neck and head, its upper torso has almond-shaped eyes with black rings around them and appears to lack a nose and mouth. Primarily brown, it has cream-colored, segmented arms and legs, with three fingers and three clawed toes respectively. The soles of its feet and its ankles have circular, yellow markings. It is an exclusively male species with no female counterpart. 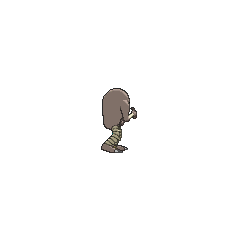 Hitmonlee's legs freely contract and stretch similar to a coiled spring. This flexibility allows Hitmonlee to run with lengthy strides and gives it greater reach for its kicks. Its excellent sense of balance enables it to kick in succession from any position. After battling, it rubs down its legs to relax the tight muscles. Rare in the wild, it is primarily found in urban areas. Hitmonlee first appeared in The Punchy Pokémon. Team Rocket stole him from a man named Giant in order to compete in the P1 Grand Prix. 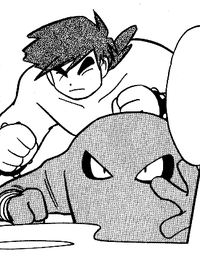 The Kicking Pokémon defeated Brock's Geodude, and Anthony's Hitmonchan (by cheating) and lost fair and square to Ash's Primeape. Shiro, a challenger to the dojo in Two Hits and a Miss used a Hitmonlee. In A Tyrogue Full of Trouble, Black Belt Kiyo owned one and fought alongside him to break a rolling boulder. He later used Hitmonlee in battle to attempt to capture a wild Tyrogue. One of the Invincible Pokémon Brothers in Gotta Catch Ya Later! has a Hitmonlee. A Hitmonlee was used during the preliminaries of the Hoenn League by Gilbert in Saved by the Beldum. Gilbert's Hitmonlee lost to Ash's Pikachu. Master Hamm used a Hitmonlee against his son Kyle, a cook, in Pasta La Vista. If the Dojo Master won, he would retire, and Kyle would have to give up his shop for the Dojo. If Kyle won, it would all stay the same. Ash, and May ended up taking the place of the two. As it was a draw, Kyle and his father decided to both work at the restaurant while Kyle's friend Terri took up ownership of the Dojo. A Hitmonlee appeared in A Marathon Rivalry!, under the ownership of Daniel. A Hitmonlee appeared in Casting a Paul on Barry!, under the ownership of Barry. Despite being able to cause a lot of damage to Paul's Ursaring, he was eventually defeated after inadvertently triggering Ursaring's Guts Ability. A Hitmonlee was seen in a Pokémon Lab in Riddle Me This. Two Hitmonlee appeared in Bad to the Bone. One was under the ownership of an unnamed Trainer, while the other one appeared in a flashback belonging to an unnamed Gym Leader. A Hitmonlee under the ownership of an unknown Trainer, appeared in Friends to the End, during the closing ceremonies of the Indigo League. Hitmonlee also appeared in The Power of One. A Hitmonlee was seen in a dojo in Wired for Battle!. A Hitmonlee appeared in Beauty and the Breeder where it participated in a Pokémon beauty contest. A Hitmonlee belonging to a Trainer appeared at the Pokémon Jujitsu Academy in Ariados, Amigos. A Hitmonlee under the ownership of Shinji had a brief appearance in The Legend of Thunder! battling Jimmy's Typhlosion. Wobbu-Palooza! featured a Hitmonlee belonging to a Festival Crasher. A Hitmonlee appeared in Lucario and the Mystery of Mew, taking part in the festival honoring Sir Aaron. Hitmonlee's first real appearance is in Tauros the Tyrant as one of the Pokémon used by the Team Rocket Grunts to catch Green. Hitmonlee later appears as one of Bruno's Pokémon which first appeared in Ponyta Tale. Later he destroyed Bill's house in Hitmonlee, Baby! (One More Time). Bruno explains that Hitmonlee's legs are so flexible, it's impossible to locate the position of his knees and attack them. A Hitmonlee statue was seen in Cianwood City Gym in Scrappy Skarmory. Hitmonlee was also seen as one of Chuck's Pokémon. In the Gym Leader faceoff of Entranced by Entei, he used Mind Reader and Reversal to turn Blue's tactics against him. A Hitmonlee appeared in Skirting Around Surskit I as a rental Pokémon that Guile Hideout stole. Hitmonlee has had more signature moves than any other Pokémon, with four: Mega Kick, Jump Kick, High Jump Kick, and Rolling Kick. Hitmonlee is the only Pokémon with a base Speed of 87. 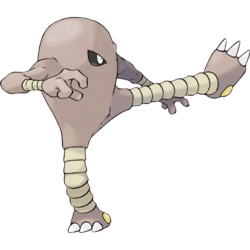 Hitmonlee may be a personification of taekwondo, a sport that focuses on kick attacks. 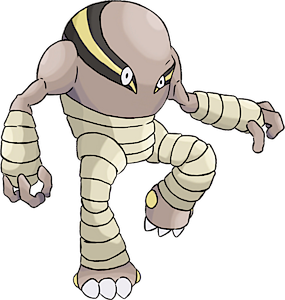 Due to its lack of a head, Hitmonlee bears resemblance to mythical headless men such as the Xing Tian and the Hindu demon Kabandha. Based on its Japanese name and kicking attribute, Hitmonlee may also represent Japanese kickboxer Tadashi Sawamura. From the Japanese names of its Abilities—Flexible, Life-Risking and Acrobatics—Hitmonlee may also be based on an acrobat.